2900 square ft. of beautiful living space with ocean & mountain views! 3 bedrooms, 2 bathrooms, large living and dining rooms, spacious fully functional kitchen with new appliances. Walk-in to full laundry room with washer & dryer. Features an amazing terrace that spans the full width of the back of the house, with fabulous views of the Gulf of Nicoya, Pacific Ocean, Puntarenas, and mountain ranges. Enjoy early morning breakfasts, mid afternoon cocktails, and beautiful sunsets on our spacious terrace. Birdwatching and just plain relaxing can also be enjoyed! Easy access to terrace from living/dining room and 2 main floor bedrooms. Plenty of parking available at front of house, or in lower carport. House is located in a 24 lot gated community, on a spacious 5000 sq. meter lot. The property still operates as a working coffee plantation. Beautiful trails, a waterfall, creeks, tilapia pond, and of course lots of coffee plants, make it a very charming and relaxing environment. Butterflies, deer, ducks, toucans, parrots, and various other birds can be seen on our property. Positano de Magallanes is a very special place! Centrally located, within 90 minutes of many major attractions such as Poas Volcano, La Paz Waterfalls & Gardens, La Fortuna, Lake Arenal, Carrera National Rainforest, Sarchi, Puntarenas, Zip-Lining, Butterfly Farms, and much more. The nearest beach is just a 35 minute drive away, part of a national rainforest, where capuchin monkeys come down from the trees to join you for lunch. Shopping is just a short 5 minute drive away, in lovely San Ramon. Large shopping mall with movie theatres and plenty of shops, the University of Costa Rica, hospital, restaurants,banks, farmers market, pharmacies, dentists, and everything else you may need during your stay. You will meet Norm & Ana, our property managers, in San Ramon. From there, they will take you to our house, a short 5 minute drive away in Magallanes. Norm & Ana will walk you through the house, pointing out its many features, and provide you with the keys. Enjoy your welcome basket, which includes some of the varied and delicious fruits available in Costa Rica. If you need something smaller, check out our other new property at VRBO #676793 , which sleeps up to 3 people. See listing for details, or contact us. Joe is an insurance broker and Liz works for a builder in Canada. They have been married for 39 years and have 3 children. Some of their interests include music, golf, reading, traveling, and spending quality time with family and friends. After looking at Florida, Mexico, and the Dominican Republic, we felt that Costa Rica had so much more to offer. The country is so beautiful, and very easy to travel through. There are many micro climates to suit individual needs and an abundance of things to do. In 1949 the country abolished their army and invested all their money into education and health care, therefore they have a well educated and happy population. Recent surveys show that Costa Ricans are one of the happiest people in the world. Costa Rica has a very low crime rate compared to other countries in Central & South America. They also have a longer life expectancy because of the lifestyle they live - Pura Vida! Our house is just 5 minutes from San Ramon, which is approximately 35 minutes west of the San Jose Airport, and is very central to everything. San Ramon has a hospital, university, shopping, churchs, movie theatres, and best of all, the weather is fabulous! Because San Ramon is 3500 ft. above sea level, the average daytime temperature all year round is 25 celcius, or 78 farenheit. Evenings are usually a little bit cooler, but very pleasant. There is no need to have air conditioning or heating in our home. If you are interested in some more heat, just drive 40 minutes west to the beach where the temperatures can reach 35 celcius plus. Our location is central to as many activities and attractions you can imagine. Poas Volcano, La Paz Waterfall & Gardens, La Fortuna & Lake Arenal, San Luis Zip-Lining, Carera National Rainforest, Sarchi, Tortuga Island, and San Jose are all a reasonable drive away. 2 full-size and fully equipped. Several mountain ranges can be seen from property. Gulf of Nicoya and Pacific Ocean. Not Required since we are in a more moderate climate and have cool breezes in the evenings. Walk-in laundry room from kitchen. Bath, kitchen, and beach towels available. 17ft by 17ft spacious living room. Seats 7 - 8 people. Cable TV, Stereo, video library in large cabinet. Large picture window with beautiful view of the Gulf of Nicoya and mountain ranges. Spices, condiments, paper towels, toilet paper, etc. Serving 8 or more. Most common untensils are included. Costa Rica travel, birds, animals, plants, etc. Also novels. Many CD's available along with stereo radio. Large DVD library available with many top hollywood movies, for both adults and children. Large lawn & gardens, surrounded by coffee plants. 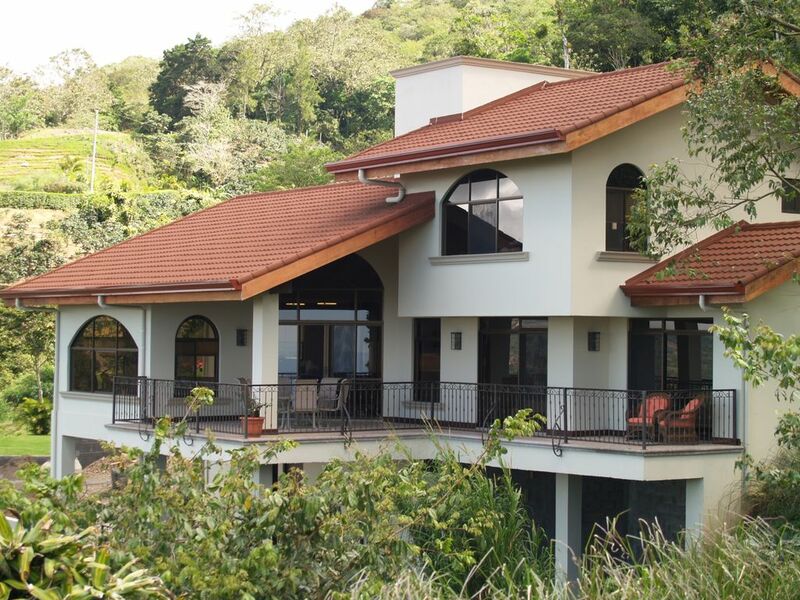 Large terrace with amazing views of Gulf of Nicoya, Pacific Ocean, and mountains. Enjoyed our stay,amazing views and very comfortable ! We are glad you enjoyed your stay at our little Piece of Paradise. Hope to see you back again in the future! From beginning to end our stay was simply amazing! Starting with our first correspondence with Joe to saying goodbye to the property managers Tim and Rachelle, who are just the best, our stay was beyond compare. The house is absolutely beautiful and very comfortable, you will want for nothing. The views are breathtaking and the cool temperatures make for an enjoyable sleep. Downtown San Ramon is very close in proximity, making for easy shopping, dining or just to submerge yourself in the daily life of ticos//ticas. We are very happy that you enjoyed your stay at our little bit of paradise. As you mentioned, our location is excellent for access to the beautiful city of San Ramon, but still gives you the freedom of a small village in the country. Also very central to a lot of attractions in Costa Rica. Tim and Rachelle do their best to make your stay as enjoyable as possible. Hope to see you again in the future! All the best. If you are looking to get away to a quiet and beautiful home in the hills of San Ramon, look no further than this one. The view is absolutely spectacular, with every shade of green you can possibly imagine, and some you can't. Rachelle and Tim, the caretakers, are so welcoming and knowledgeable about Costa Rica and especially the central valley area. And their daughter is a heck of a chef -- we hired her to cook a meal for us one night and it was wonderful.. There is a cabinet full of DVDs to watch at night, and no need for AC. Just open a window and you will sleep perfectly. If you are a first timer in Costa Rica and a little nervous about where you rent, this is a gated community and the house felt very safe. We knew we were in good hands from start to finish. This really is everything you can imagine and more. We are so happy that you enjoyed your stay at our little paradise in Costa Rica. We try our very best to make your experience as enjoyable as possible. Of course, the property and surroundings help immensely in creating the right atmosphere for our guests. Rachelle & Tim always do their best to welcome our guests and enhance their experience. Hope to see you back again in the future! This is our second time staying at this property. We certainly enjoyed ourselves. The property managers were a great resource but certainly respected your privacy. Location is superb - since it allows you to take day-trips to various parts of the country. If you choose not to do that - just relaxing in the house - is great too. The pictures are very accurate. Everything is provided for your comfort - except for your toothbrush and your food!!!! If looking for a wonderful get-away - you should consider this property. Thank you Joe and Liz for another wonderful vacation. Very happy to hear that you enjoyed your stay at our property again. As you mentioned, it's a great location for exploring beautiful Costa Rica. Our property managers, Marty & Jamie, are always eager to help in any way they can, to help make your stay as enjoyable as possible. It was a pleasure again, having you stay as our guests. Come back soon! This home is a lovely experience. We have stayed in Costa Rica many, many times over the last 20 years and this is house rates at the top. The neighborhood is quiet and safe. The grounds are lovely and the birding excellent. My daughter and I walked to the little store several times. It took 16 minutes round trip We also walked down the road and up for an extreme workout (we are runners and it was tough). The house had everything you need and more. There are views from every window of the ocean and mountains. The beds are super comfy and the furnishings of nice quality. For the art lover there is wonderful paintings and sculptures. The washer and dryer work great. David and Kim were awesome. David became our chauffeur when the rental agency lost our contract and there were no other cars available during the holiday week. He picked us up and brought us to see friends and sights around the central valley. He was extremely punctual and an excellent driver. So why 4 stars instead of 5? It is a small thing but for the money something that should not be an issue. Hot water. The book says that there could be hot water issues if the water pressure is low. We had very good water pressure the entire week...but not hot water. It was hit or miss, but mostly miss. We have several tankless water heaters in the states and had one in our home we owned in Costa Rica. We have never had a problem heating all the water needed for the house . David said that he was aware and told the owner about it. Hopefully, this review will motivate a repair or replacement. We would and will definitely stay at this home again. Very happy to hear that you enjoyed your stay in Costa Rica. You're right, our home and the location, are second to none. Wish the hot water system had been working properly for you, and will definitely have it looked at. We have a hot water solar system, and a back up on demand electric water heater, to help ensure there's always hot water, so it's a bit of a mystery that there were hot water issues, but it's Costa Rica and stuff happens there. Thanks again for choosing our home for your stay. Hope to see you again soon! This is a lovely property set in a private gated neighborhood about 8 kilometers from San Ramon. Nice and peaceful and well appointed with big kitchen, patio, laundry. ! It is about a 45 minute plus drive from SJO airport. We drove just under two hours to visit arenal volcano and rainforest. We also visited San Luis (45 mins) for a good zip line experience and Transitional forest walk. Cost for those two were $68 and $25 with guide. Driving in Costa Rica is not for the feint hearted and the neighborhood was quite steep with tight bends. We had a 4x4 as recommended. We also went to playa Dona Ana beach which was 45 mins south. We did split our vacation into 5 days at the beach (jaco) and 6 days in the mountains. Very happy you enjoyed your stay, and the beautiful Costa Rica. Hope to see you again in the future. Just 8 minutes west of San Ramon. Major attractions within 90 minutes of our home include Poas Volcano, La Paz Waterfalls & Gardens, San Luis Zip-Lining, La Fortuna, Lake Arenal & Volcano, Sarchi, Carara National Rainforest, and the Gulf of Nicoya with several beaches. Enjoy many activities such as Zip-lining, Hiking, Whitewater Rafting, Sports Fishing, Swimming, Biking, Sunbathing, Snorkeling, Scuba-diving, Birdwatching, and much more! It's a nature lover's feast.